The ocean was like a lake today! We found 1 solo northbound Gray Whale along with some spread out Common Dolphin. We then had reports of other whales coming around the corner so we headed in that direction. With the water so calm, we easily spotted a group of 5 Grays! Another gorgeous day on the water! Five minutes outside of the harbor we found close to 2000 Common Dolphin feeding on a huge bait ball of sardines! Mixed in with the dolphin were sea lions, Pelicans and cormorants. We spent a good amount of time watching the birds diving and the dolphins swimming through the bait fish and eating. 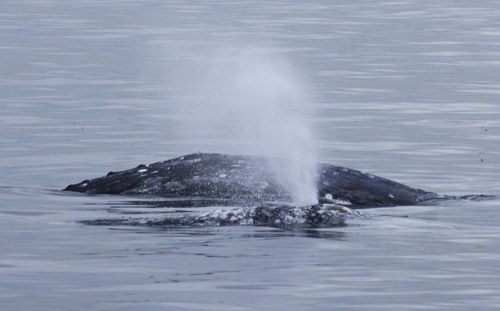 We then moved on to 3 Gray Whales! Two of the whales came pretty close to the boat, and one of these whales fluked frequently. On Monday March 5th, we had calm seas and beautiful weather for our 10am whale watch. We started off by seeing 3 Gray Whales including 1 calf. After leaving those whales, we came upon a group of 1000+ Common Dolphin! we saw 8 gray whales, 5 fin whales and tons of dolphin. we are smack dab in the middle of the gray whale migration. there are still more whales heading southbound than northbound so it looks like the season this year will be running longer than normal.